BITRON C range clarifiers effectively fight algae with intelligent UVC technology. Pathogens and bacteria are safely reduced through the UVC radiation. All Bitron devices have well-designed bypass technology. This allows individual adjustment of the water flow which is routed over the UVC bulb via the throttle handle. This makes it possible to set the optimal flow rate. Whether swimming pond, garden biotope, or fish and koi pond – Bitron devices are an ideal fit for any pond. Algae, fish waste, and other pond pollutants can reduce the UVC radiation. The unique and integrated cleaning mechanism of the Bitron C range ensures simple, fast, and permanent cleaning of the UVC light source. This guarantees your customers the sustainable effect of the UVC radiation – for untroubled satisfaction. Integrated magnets protect the system from dangerous lime deposits. Lime that is in the water can assume a crystalline form under the thermal development of the UVC light. These aggressive lime structures can destroy the bulb or block the rotor in the pump. The permanent magnets of the OASE Bitron clarifier prevent these crystals from forming through magnetic treatment of the water. This protects the pond as well as the filtration system and guarantees the unusually long service life of the OASE components. All Bitron range UVC clarifiers are equipped with an indicator light or a control window. Thus the function of the UVC bulb can be checked at any time. The light tubes should be changed after every 10,000 hours of operation, to guarantee the full-strength capacity of the UVC light waves. The Bitron devices have been designed in accordance with the highest safety factors. This has also been confirmed by the German VDE, which has tested and approved the device. 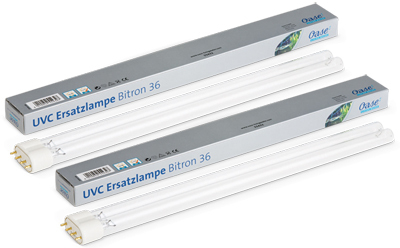 With the performance they offer, Bitron UVC clarifiers are a valuable component in OASE BIOsys filter systems. The permanent magnet prevents the calcification of pump and filter parts. Bitron C devices are available in 4 variants (Bitron 36C/55C/72C/110C).